This article is the sequel to Swooping into SharePoint Site Designs, in which I related my experience working behind the scenes on the world’s first SharePoint reality show! This time I’ll explain the code so you can build similar solutions if you so desire. The sample shows how to build a site design and script for a simple department site, as created in the SharePoint Swoop video. A team of experts worked to redesign an Intranet site in just three days. This site design was developed behind the scenes to provide a template for all the company’s department sites. To install Script Lab, open Word, Excel or PowerPoint and on the Insert tab, click Store. Type “script lab in” the search box and hit enter. Then select Script Lab from the list and click Add. Once added, you will see a new Script Lab tab. From there, you click the Code button to open the task pane. If you click the hamburger menu you will see an option to Sign Into GitHub. This will allow you to create Gist’s and access and save code snippets to GitHub. Go to the list/library that the workflow applies to. Open and modify the “Workflow Task View”. If that view does not exist, then create it with that exact name. Add or remove the desired column fields, then click OK to finish. The Item Properties panel on workflow tasks for that specific list/library will now display the column fields in the Workflow Task View. The “Workflow Status” column will always be the first item in the Item Properties panel. 2. 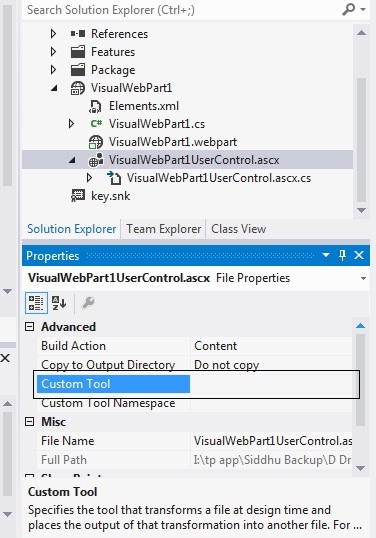 Right Click on VisualWebPart1UserControl.ascx file and click on Properties. 3.if VisualWebPart1UserControl.g.cs is present then delete it first. automatically generate background file forcefully(VisualWebPart1UserControl.g.cs). When I’m trying to set the MySiteHostUrl via PowerShell it throws an error. Taking a closer look it seems after initializing the UserProfileManager class an UserProfileApplicationNotAvailableException is raised. The PowerShell script I’m using is retrieving the current context and initializing the UserProfileManager object. This should provide me access to the MySiteHostUrl. The solution to this is providing the account running the PowerShell script sharing permissions “Full Control” on the User Profile Service Application. Management of user profile properties in SharePoint CA user interface is easy and intuitive, but when it comes to changing the display order of user profile properties, this becomes a difficult and frustrating task (and it has been like this since 2007). Powershell scripting proves again very handy. You can find several other blog posts on this topic, but all I have found use the obsolete SharePoint API (2007) to do this. First of all we need a PS script to list the current order of user profile properties. Next step would be to set up a configuration xml file, that lets us define what properties we want to change. The following config sample will change the display order of two user profile properties. The final step, the PS script that makes the changes. The function for update requires two input parameters: a config file path, and the my site url.